Notes: Jun. 1943←Jul. 1943→Aug. 1943 Vol 17, No 7. Cover illustrates "Carbon-Copy Killer." Table of contents credits interior illustrations to Julian, Robert Fuqua, Malcolm Schmidt, Magarian, Virgil Finlay, Ronald Clyne, and Joe Sewell. Attributions for individual illustrations by signature if present or recognizable, using the most complete form of the artist's name found in this issue. The "Correspondence Corner" was discontinued for national security reasons. 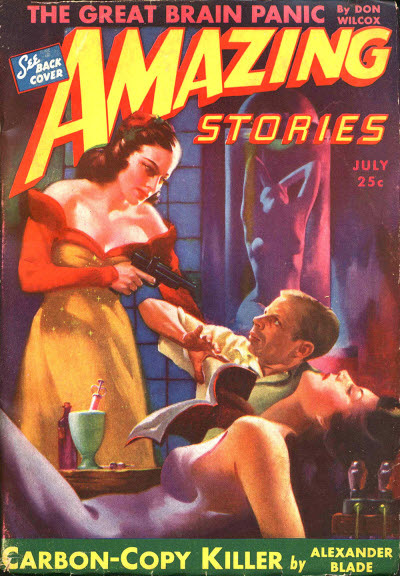 According to "The Man from Mars: Ray Palmer's Amazing Pulp Journey" by Fred Nadis Palmer is the model for the evil scientist and his secretary, Elaine, is the model for the woman with the gun.